Can you find the Painting In A Tree? Did you know that West Fraser paintings sometimes hang on trees? The back of this year’s Painting in a Tree. Follow along with The Gibbes Museum for your weekly clue. West Fraser has always given back to the communities that have supported him. He has done this in various ways. One of these ways has been through his on version of ‘pay it forward,’ or Painting in a Tree (fondly known as PIAT). In 2009, a few years after the stock market lost it’s value, banks failed, businesses closed, many people lost their jobs, and generally it felt like the sky was falling, West hung a small plein aire painting in a tree on Cumberland Island, Ga. for one lucky person to find. It was a gift with strings attached, literal and metaphorical. His only request was that whoever was so lucky as to find his hidden painting give back to the charity of their choice. Of course he encouraged the finder to give to that arts, but the charity was finders choice. And no gift was too small, it is all about the giving not the size of the gift. He then hung three more that year, all found, eventually. 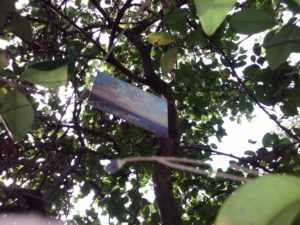 And over the years a total of eight paintings have been hung in trees to be found by lucky adventurers. This year as his 9th solo exhibition hangs at the Gibbes Museum of Art, he hangs another painting in a tree in celebration of his journey as well as to encourage others to give back in whatever way you can. The current painting is hanging in Charleston County, and that’s all you get for now. 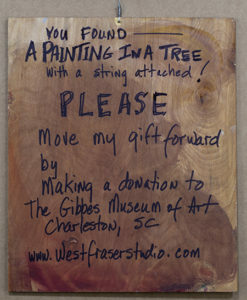 The Gibbes Museum, Helena Fox Fine Art and West Fraser Studio will be doling out clues weekly through various avenues. If you’d like to be ‘in the know’ please follow along with the museums event ‘Painting In A Tree Scavenger Hunt’ on their Facebook page. To get there, please follow the link below. And happy hunting!